Save time, build a better campaign and bask in your players’ adoration, with GM Resources designed specifically for YOU–the busy GM. We don’t deluge you in gobs of extra rules or options that just add complexity, confusion and bloat to the game. We simply publish richly detailed, easy to use material designed to help you, the busy GM, prepare quicker and prepare better. And, if you don’t like them, we offer a 30-day Money Back Guarantee on all our ebooks. This free System Neutral resource presents a NPC designed to be easily inserted into virtually any GM’s campaign. Use this NPC along with its hook as a starting point to craft an interesting, memorable encounter. 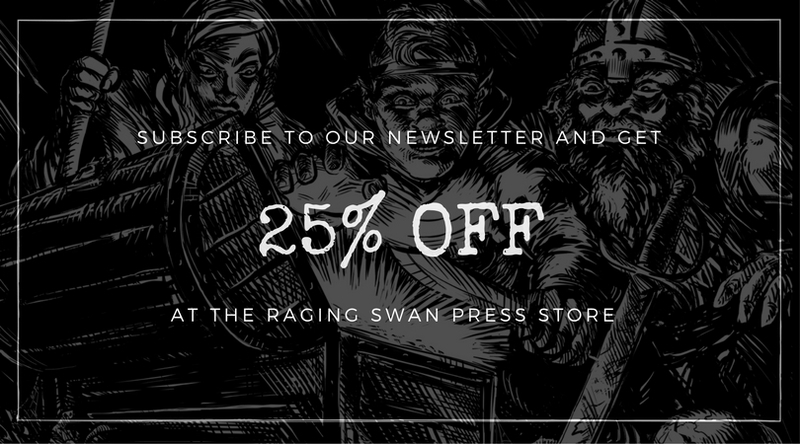 Stocked full of your favourite Raging Swan Press PDFs and some exclusive bundle deals, we also have poster maps for your gaming pleasure. Get free gold, when you sign up, to spend on our GM’s Resources. Make your game more awesome! Get cool stuff designed to make your campaign easier to prepare and easier to run. I am sad to say that today I unfollowed Raging Swan on Facebook. I enjoy your products, and have enjoyed your blog for many years, but I have noticed in recent months that your posts have reached a ridiculous level. One or two a week from an RPG site is fine… but four a day is ridiculous and amounts to spamming. Sorry man – as I say, I am a big fan of your products… but too much of a good thing, is a bad thing! No drama, Carl! I’m delighted you find our products useful and I’m sorry you find the number of Facebook posts we make too much. I have readers in many parts of the world and I post four times a day because of the accursed time zones. Again, sorry it was too much for you. Good luck with your game!